This ocean-themed kitchen accessory will make a wonderful addition to your breakfast nook. 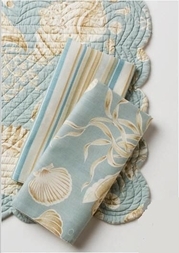 Matches the Natural Shell collection, this 100% double-layerd cotton napkin displays a fresh shell and starfish motif on one side, and reverses to the coordinated stripe. Sold individually, or in sets of: 2, 4, or 8 pieces.